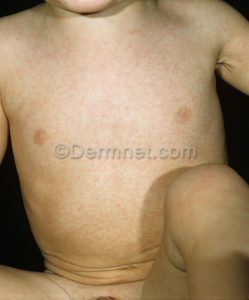 Exanthum subitum is most commonly known as roseola. Roseola typically affects children ages 6 months old to 2 years old. It is caused by the human herpesvirus type 6. The typical presentation is one of high fever (usually > 102-103°F) for 3 days followed by an end to fever and a diffuse rash on day 4. The rash may last hours to days. The rash typically begins on the trunk and spreads to the rest of the body. Treatment of roseola is supportive care. It is recommended that age-appropriate doses of acetaminophen or ibuprofen be given to control the fevers. Aspirin should not be used! When aspirin is used in children with viral illnesses, it can lead to Reye’s syndrome, which can lead to liver failure and even death. Prevent dehydration by providing your child with regular fluids (breastmilk, formula, Pedialyte, popsicles, ice chips). For the rash, an over-the-counter 1% hydrocortisone cream can be used to calm the rash. Take your child to the doctor if the fever is uncontrollable or if your child is dehydrated or lethargic. Take your child to the emergency room if an uncontrolled fever leads to a seizure. Erythema infectiosum is commonly known as slapped cheek or fifth’s disease. Slapped cheek (fifth’s disease) typically affects children between 3 and 10 years old. The cause is parvovirus B19. Children present with typical viral symptoms including fever, headaches, achiness, and stomach aches. 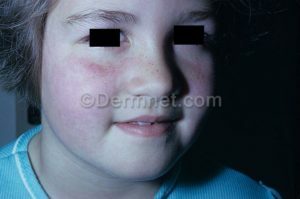 A bright rash usually appears on the cheeks giving a “slapped cheek” appearance. In older individuals, the rash may also present as a lacy-like rash affecting the arms, legs, chest and back. Treatment of slapped cheek (fifth’s disease) is supportive. Over-the-counter 1% hydrocortisone cream can be used to calm the rash. Special consideration is given in immunosuppressed children, children with sickle cell anemia and pregnant women with unknown exposure to parvovirus. All of these individuals should seek attention by a doctor if there is known exposure to parvovirus. Hand, foot and mouth disease typically affects children 1 to 4 years old, and it is usually caused by enteroviruses, specifically coxsackie virus. This disease is most common in the summer to early fall. The rash appears as blister-like lesions in the mouth, specifically the throat, tongue, inside cheeks, gums, and hard palate. Juicy red bumps can also appear on the palms and soles and a general rash may also appear on the trunk and buttocks. 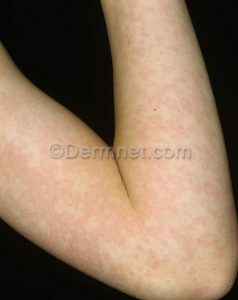 Fever is usually associated with this rash. Over-the-counter 1% hydrocortisone cream can be used to calm the rash. Age-appropriate doses of acetaminophen and ibuprofen can be given to manage the fever. Aspirin should not be given to any viral rash including Hand, foot, and mouth disease as Reye’s syndrome may present. Reye’s syndrome can lead to liver failure and even death. Because of the pain from the blisters, children may lose their appetite and not eat or drink. Push fluids as much as possible with icy treats like popsicles and fluids with added elcetrolytes like Pedialyte. If your child refuses to drink or eat, seek attention from a doctor as the doctor may be able to prescribe something to help with the pain. If your child becomes dehydrated and lethargic, take your child to the doctor or even the emergency room.